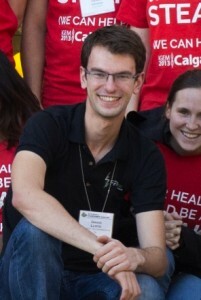 David Lloyd grew up in Medicine Hat, AB, where he attend college for the first two years of his academic career. From there, he finished a degree in Biochemistry at the University of Alberta and a Master’s of Science degree at the University of Calgary with a focus in Cancer Biology. His academic accolades are numerous and include a variety of scholarships, peer-reviewed publications, and conference awards. In addition to his academic work, David has been involved for more than five years with the international Genetically Engineered Machines (iGEM) competition based out of MIT in Boston. This competition challenges over 300 undergraduate teams worldwide to create a synthetic biological system that can change the world. David has been a student, advisor, and now judge and track coordinator for iGEM, and his teams have been the recipient of over ten awards, and are ranked internationally within the top 16. David is now the Co-Founder and Director of FREDsense Technologies, an early stage start-up focused on developing biosensors to monitor water in the oil and gas industry. In addition, David volunteers extensively in the community with groups such as the Alberta Women’s Science Network, MentorUp, and MindFuel. He hopes to change the world using biotechnology to make it better for everyone! Could you share with us some background information on the stage that your venture was at before you started the LLP? Prior to attending LLP our company had put together a rough business plan, and was beginning to seek investment for our ideas. We still had a large amount of technical work to achieve and had based all of our assumptions about our market on information we could find in government documents and word of mouth from friends, family, and business colleagues. What aspects of the LLP motivated you to participate? LLP seemed like just the sort of program that we needed. We had come a long way from being a group of alumni from the University but our technical group of co-founders had never really gone out and talked to anyone that would use our product. The timeline and pace of the activities seemed realistic and our group thought that the potential for this to accelerate our business would be incredibly advantageous. What aspects were the most useful for the particular stage that you were at? The skill training in being able to a) find customers b) contact them and garner advise and c) determine the direction for the development of our product were all incredibly useful components of the program. Our company has seen much acceleration from being able to have a more clearly defined marketing strategy that is based on evidence from real customers. Were you able to apply your experiences during the LLP workshops to your work? I find that I frequently apply what I have learned in LLP to the company’s business development. It has dramatically aided the writing of our business plan documents for competitions, given us a better idea of what customers are truly looking for in our product, and dramatically changed our operating strategies to better reflect those of the industry we are entering. I continue to encounter situations where I apply what I was doing in the program to my daily business tasks, having meetings with potential clients, and learning how to gain insight into our strategies and determine the likelihood of their success. How did your participation at the LLP accelerated FREDsense Technologies to the next stage of your venture? With the help of the LLP program, we have won several key business plan competitions which have accelerated our growth as a source of capital, contacts, and general interest in Canada. Our company has made two large pivots in the technology that we are developing directly because of what we have learned from the program. With funds in hand and a plan to market we are prepared to deliver on our milestones and develop a product with a much greater chance of success. If you could give any piece of advice to younger version of yourself, wanting to start a company out of a research idea, what would that be? If I could give myself any advice, I think it would be to engage in programs like LLP much earlier. This program and many others that we have been a part of have been critical in establishing our company’s plan to move forward. If we had engaged with these programs earlier I feel we would have reached our goals much faster as this advice and hands-on training is truly a wonderful way of learning about start-ups.